Home/Bed Bugs, General Pest Control, Our Blog, Prevention, Residential/Bed Bugs: What Are They & How to Get Rid of Them! Bed bugs belong to the family Cimicidae, sometimes referred as red coats, chiches or mahogany flats. 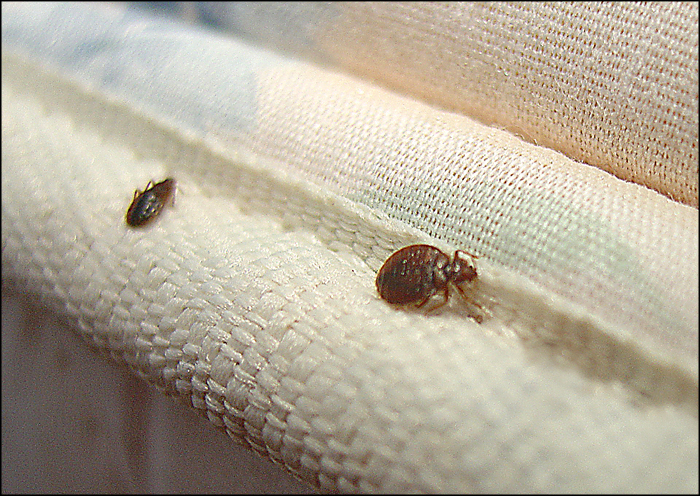 Bed bugs are parasitic insects that feed exclusively on blood. Cimex lectularus, the common bed bug as it is best known, prefers to feed on human blood. There are other Cimex species that feed on animals like the bat bugs, if by chance the wild animal host are no longer available, they may bite humans. Bed bugs are suspected to carry diseases like leprosy, oriental sore, Q-fever and brucellosis, but have never been implicated in the spread of human disease. Their bite is painless and generally not noticed. These bites may be mistaken for a rash of another cause. The bites are usually small, with flat or raised bumps on the skin, and the bumps are usually in a straight line. Symptoms include redness, swelling, itching, and psychological effects have been noticed on some people. Bed Bugs are found in human dwellings, bird nests, and bat caves; they are generally drawn to these areas because of the warmth, places to hide, and hosts to feed on. In human dwellings, some of the areas for harborage include cracks and crevices in walls, furniture, behind wall paper, wooden paneling, or under carpeting. Bed bugs are normally active at night but will feed during the day when hungry, they normally harbor close to the host they are feeding on. They are attracted to warmth, heat, and carbon dioxide. Bed bugs are normally transported on clothing, luggage, bedding, and furniture, but very rarely venture far from their host. The adults are approximately 3/16 inches long, appear to be very flat and have a light brown to reddish brown color. They have six legs, and their body is broader than they are long, somewhat oval shaped. If I Have Bed Bugs, How Long Do They Live? Both the male and female bed bugs need blood to grow and reproduce. The female can lay approximately 200 eggs during her life span at a rate of 12 eggs per day. These eggs are adhered to surfaces by a transparent cement. It usually takes 6 to 17 days for the bed bug nymphs to emerge from the eggs. As the nymphs grow they molt there skin, and after 5 molts (which is normally ten weeks), the nymphs reach maturity. Ok, I Have Bed Bugs, Now What? As a homeowner you should look for obvious signs of bed bugs, and do certain things to help control the bedbugs. When you have a lot of bed bugs nesting in an area you will notice a foul odor from their oily secretions. Look for excrement left around in their hiding places, reddish brown spots on mattresses and furniture are common locations. Vacuuming, caulking, and removing or sealing loose wallpaper. Using steam cleaners or hot water to clean mattresses is questionable. Heat is readily absorbed by the mattress and does not harm bed bugs. Install box spring and mattress bed bug covers. How many bed bug jobs did you perform in the last year? Can you provide a copy of treatment protocol? What products do you use to eliminate and prevent infestations? Can you provide references of your work with bed bugs? The cost is important to know, because too low of a cost could mean the service tech will not put the necessary time in to control your problem, but some companies overcharge by providing too much unnecessary service. Bed bug monitoring devices are inexpensive and a great tool to find bed bugs if live bed bugs cant be found. Insecticide applications: These are the most common method of treating bedbugs, and if done correctly it can be very effective. Most companies require 3 separate applications when using insecticides. Types of insecticides used include sprays, aerosol formulations, desiccant dusts and insecticide dusts. Freezing, in order to be effective the temperatures must be below 3 degrees. Most home freezers are capable for maintaining these temperatures, and this control is usually used for small household objects. Fungus, Besuveria bassiom, can be sprayed on clothing, etc. but can be problematic with people that have compromised immune system. Drugs, stomectol usually used to kill parasitic worms, will also kill bed bugs. This is taken by the host and when the bed bugs feed, it will die in a few days. It is very important to remember that bed bugs are a community problem, and the best treatment and control measures may not be an option for all members of society. Any concerns or questions about bed bugs please contact us, Alexander Exterminating, 919-799-9990 and ask to speak to Vinny Nolfo.